If you use a free app to map your run, track your biking or monitor your fitness activity, most likely you're now feeding that data right into a fitness company that wants to sell you something. 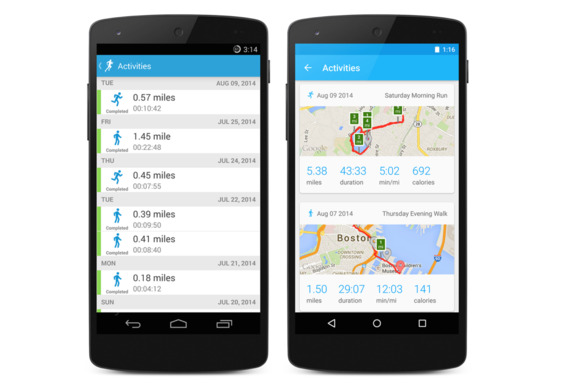 In February, sports equipment company ASICS acquired FitnessKeeper, which operates the Runkeeper app. The move might have raised eyebrows if it had been the first brand to do this, but it was the third in recent app acquisitions by sporting goods-related companies. In August of last year, Adidas acquired Runtastic, and in February of 2015, Under Armour acquired both Endomondo and MyFitnessPal (UA had already acquired MapMyFitness in 2013). These are no small deals. Under Armour has spent $710 million on tracker apps since 2013. But for good reason: The wearable device market is expected to generate $6.3 billion by 2020, according to Tractica. And by spending big now, these fitness brands are buying up ready-made fitness communities, and all the data and engagement that accompanies them. All three fitness brands declined requests to be interviewed for this story; however, their statements about their respective purchases are similar. A statement from Asics referenced the growing fitness tracking app market and that it believes that the "integration of Runkeeper's'' globally recognized brand and worldwide user base with ASICS' technological competence in manufacturing will lead to continued enhancement of corporate value." User base at time of purchase: over 33 million registered users. Cost: $85 million. When Adidas announced its acquisition of Runtastic, Adidas group CEO Herbert Hainer said that the move was in line with its strategic business plan and that the acquisition "will add considerable value on our journey to deliver new world-class digital sports experiences. In addition, it offers the opportunity to grow a highly engaged user base, and leverage the power of our broad portfolio product." User base at time of purchase: 70 million registered users and more than 140 app downloads. Cost: $242 million. When Under Armour acquired MyFitnessPal and Endomondo, Kevin Plank, chairman and CEO of Under Armour, said in a statement that both acquisitions "have established track records of unmatched equity, expertise and passion in the fitness and nutrition space, and they are ideal partners to enable Under Armour to provide data-driven, proactive solutions to help athletes of all levels lead healthier and more active lifestyles." The press release also touted each company's existing user base, which included, at time of purchase, more than 80 million registered users for MyFitnessPal, and more than 20 million registered users for Endomondo and for MyFitnessPal, each. Cost: $475 million for MyFitnessPal and $85 million for Endomondo in addition to the $150 million it paid for MapMyFitness in 2013. One thing in common (aside from the millions of dollars being thrown around): Each fitness companies stress the importance of the apps' user bases. That's the real value here, says Sarah Newhall, executive vice president of strategy and insights for Blue State Digital. "If you buy the right app, you're essentially buying a community of users you can tap into a little bit more effectively," she says. Jesse Epstein, program chair of Web and multimedia design at the Touro Graduate School of Technology, calls this the natural result of how advertising has evolved. "The whole landscape of advertising has changed dramatically with the advent of social media and mobile technology," he says. "People just relate to brands different, and a lot of brands have adjusted to that by trying to involve consumers in their brand." Buying apps that people already use and love is one way to do that. In retail, Newhall says, so much of a relationship a company has with consumers is transactional, and they do things to drive consumers to make purchases. Buying fitness-tracking apps will help these companies "better understand and build a relationship with a community of users that's outside the transaction." The sheer amount of data that users of the apps create is a benefit, too, Newhall says, and that the fitness brands can "track interactions with the health and wellness state," and that the companies can then adjust their own products based on that information." App makers are benefitting from these deals too – aside from the cash, says Newhall. "The real value in their being aligned with some of these brands, just from the perspective of scale, is of getting the resources they need to continue to grow," she says. "It enables them to continue to act not as a solo operator but some degree of being able to scale up the product with resources of a big global brand." Newhall adds that she's a user of MapMyRun, which falls under MapMyFitness acquired by Under Armour. "What I noticed is that the product wasn't evolving as quickly as I expected over time, but that started to change" after Under Armour stepped in. "Some companies may want to place an original app online, but others find a turnkey solution and buy it," says Epstein. "It's an economic decision." One brand that decided buying something else wasn't worth it is Nike. Instead, it invested in its own platforms and apps. In 2006, it created Nike+ for iPods, quickly following it with an iPhone version. In 2012, it launched the NikeFuel band, a fitness tracker they discontinued two year later. But that doesn’t mean they got out of the fitness app business. Far from it: As of April 2014 (the most recent numbers available), the Nike+ Running app had 28 million users on iPhones and Androids. "They've invested a lot of time in building up resources," Newhall says. By doing it themselves, companies can "tailor it to exactly what you want it to be. There's no question of whether or not it's part of your brand equity." Whether or not that brand equity will transfer from app users to the fitness companies who now own the apps is the unknown here, says Newhall. Part of that will involve what companies do with the data they just acquired, and if it's used in a responsible fashion. If the innovations being brought adds value to the consumer, then these acquisitions will work. However, if "data's just being taken and I'm being marketed all this stuff that I didn't sign up for," she says, the apps will lose users and so will the brands that bought them, too. "It's like Spiderman: With great power comes great responsibility," says Newhall. These companies now "own so much of an understanding of what these people are doing, what their mood is on a daily basis. You have a responsibility as an owner of that information to use it in a smart way." Jen A. Miller is a freelance journalist from New Jersey who writes for the New York Times, Philadelphia Inquirer and Runner's World, among others.